Welcome To Our Family Dental Practice in Beaumont! 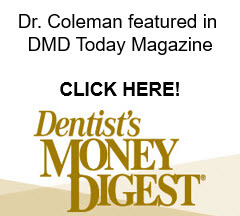 Alan B. Coleman, DDS welcomes new and existing patients of all ages. Dr. Coleman, along with his skilled team, dedicates their years of experience to serving the community with family-friendly dentistry. Our tailored treatments are sure to enhance your dental health and bring out your smile’s beauty. Your smile’s health is our highest priority. With over 30 years of experience in the field, Dr. Alan B. Coleman is passionate about improving his craft. His commitment to continued education reflects in our quality and effective treatments. Our dentist performs thorough examinations to understand your current oral health standing. From there, we consult with patients to address their concerns and exceed their expectations with treatment. Dr. Alan B. Coleman prioritizes your needs and only recommends the best treatments for your specific needs. We do not believe in up-selling procedures or wasting your money! At Dr. Coleman’s office, visiting patients know they are in a relaxing and trusting environment. Our entire dental team takes the time to establish strong communication with patients and treat them like family. Dr. Coleman does not just “go to work,” he takes pride in his occupation and does all he can to provide effective treatment procedures all while giving back to the community. Call Or Visit Our Practice Today! Dr. Alan B. Coleman and his capable staff are honored to serve patients and their families in the communities of Beaumont, Lumberton, and Mid County. We encourage you and your loved ones to schedule a consultation with our knowledgeable and friendly dentist!